Successfully Added Resonance Speaker - i-Jerry Surface Vibration Speaker to your Shopping Cart. i-Jerry Resonance Speaker! Pull the i-Jerry's two lovable ears to control the volume and change songs. This tech gadget looks like a robotic mouse, but its actually a surface vibration (resonance) speaker that causes whatever surface the i-Jerry is placed on to vibrate, transforming that surface into a sound enhancing speaker. This adorable i-Jerry resonance speaker is perfect for any application, be it in your living room, study, bedroom and even in your office to keep you company while you work. With its fashionably and ultra-modern looks, this resonance speaker will make everyone around you jealous and want one. The i-Jerry resonance speaker also comes with 2GB of internal memory, meaning you can transfer all your favorite MP3 music files by connecting the i-Jerry to your PC using the included USB cable. Thereby making it ready to play all your favorite music in an instant! 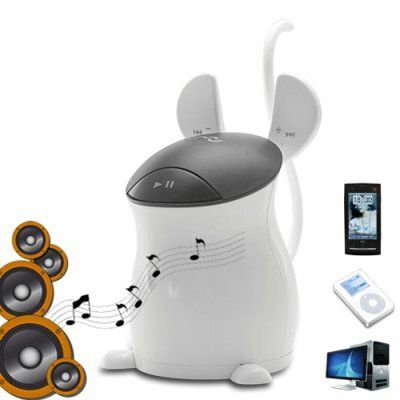 In addition, you can also connect an array of digital media players as well as your cellphone to the i-Jerry resonance speaker to play and listen to your music like never before. To use this Resonance Loud Speaker, place it on any flat surface, connect the 3.5mm audio cable to your computer, MP3 player, cellphone, MP4 player, or any other media player and then press play. Enjoy the nice things in life and get this i-Jerry resonance speaker today. Click "Add to Cart" now and we'll express ship you a sample straight away. This adorable i-jerry resonance speaker is brought to you by the warm and cuddly wholesale electronics provider, Chinavasion. If I place this Resonance Speaker in a bin-like basket, will that amplify the sound? No, this resonance speaker only comes with a wall power adapter, rechargeable batteries cannot deliver the same output performance as direct power connection to a wall socket.